In a day of swift political developments, Governor Satyapal Malik dissolved the Jammu and Kashmir Assembly on Wednesday evening, shortly after PDP leader and former chief minister Mehbooba Mufti faxed a letter to him staking claim to form government in the state with support of the Congress and tje National Conference. Mehbooba Mufti wrote a letter to the Governor claiming support of 56 MLAs in the 87-member Assembly. 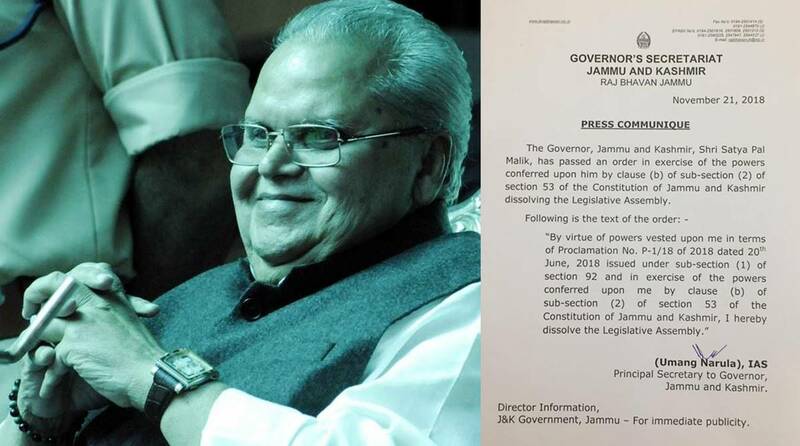 “The Governor while exercising powers conferred upon him by clause (b) of sub-section (2) of section 53 of the Constitution of Jammu and Kashmir dissolved the Legislative Assembly,” said a press communiqué issued by Umang Narula, Principal Secretary to the Governor. The state has been under the Governor’s rule since 19 June when the PDP-BJP coalition government fell as the latter withdrew support to the Mehbooba Mufti-led alliance regime. The then Governor NN Vohra, while imposing Governor’s rule, did not dissolve the Assembly. Malik had recently said the Assembly would not be dissolved. Dissolution of the Assembly however appeared on the cards when the BJP started making attempts earlier during the day to block the three parties from coming to power. Lone claimed support of 18 MLAs besides the 25-strong BJP, asserting that it was more than the required number for majority. “You might have gathered from the media reports that the Congress and NC have also decided to extend support to our party to form a government in the state,” Mehbooba said in the letter that she faxed from Srinagar after hectic parleys between leaders of the three parties. Until the news of dissolution came, former minister Altaf Bukhari of the PDP was tipped to be the next CM of the PDP-led collation. 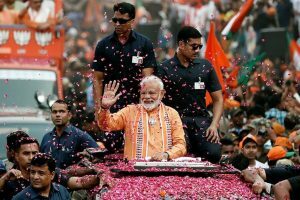 Speaking to the media earlier int he day, he had said the people of Jammu and Kashmir would soon get “good news” regarding government formation in the state. The NC, Congress and PDP have decided to stage protests against the Governor’s sudden decision to dissolve the Assembly. Calling the decision “undemocratic”, these parties have decided to stage protests throughout the state.